One final point in your body analysis is to run as effortlessly as possible. Keep looking for muscles that are tense or tight when they don’t need to be and work on relaxing them. The end goal is to use only the muscles you need to run efficiently and nothing else. Areas that tend to carry excess tension are the face, jaw,shoulders, arms, legs. Work your way down from face to feet. Face relax the frown lines, relax the jaw muscles, mouth slightly open. Shoulders, relax your shoulders let the arms swing easily under them. Arms, relax your arms, upper and lower arm at 90 degrees, forefinger and thumb touching lightly, swing the hands back to your hip and let them return on their own. Imagine elbowing somebody behind you. Elbows and hands should lightly brush your sides. Legs, allow the trailing leg to bend at the knee, relax the leg that’s in the air and allow it to swing forward. This is a lot to take in at one sitting and it’s a constant work in progress. Make small changes to one thing at a time. Don’t over-complicate your training session with an obsession on form. 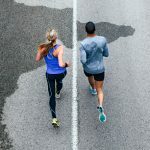 The best time to work on form is during an Easy run an Easy part of your run. Make small changes on a regular basis and eventually they become a part of your running. Let me know if you need more information. If you’d like to work on your form I have a Mindful Running clinics scheduled regularly. You can book for that on the web site. Or we can schedule private sessions that suit you.